Assalamu alaykum Dear Brother and all Cooperating with you. I would like here just to say Jazakallahu khairan for the great job done and put to public for free use — Allahu akbar! It’s really “maasha Allah!”. I could not believe long ago to be given such opportunity just to find someone who be offering free lecture on the knowledge of knowledge of this kind. Subh’anallah! You have made it from this and all other available on this website. I /we pray Allah to assist more and give long life to you and those cooperating to this task in order for you to achieve the most of your potential to the education of Muslim and non-Muslim Ummah with Islamic knowledge or the knowledge of its Language (Arabic language) as well. And May Allah open the heard and heart, increase the intelligence and strengthen the faith of His slaves students of this great knowledge reaching this website so that the return (absorbed value) can be great and turned out into great virtue and behaviors with better servants of our communities, hence a shining life in Dunia and Akhirah. Long life and prosperity to you: jazakallahukum khairan. that I actually will need to…HaHa). You definitely put a brand new spin on a subject that’s been discussed for decades. Great stuff, just excellent! 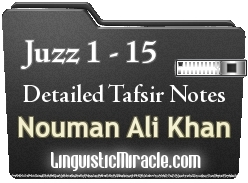 May Allah reward all those who have made the tafsir notes a possibility! May He also attribute all the sawaab gained from those who acquire knowledge and wisdom from these notes, back to those who made it possible. Aameen, aamen ya Rabb al alamin!